Penny Pritzker has served as the 38th U.S. Secretary of Commerce since being sworn in by Vice President Joe Biden on June 26, 2013. As Secretary of Commerce, she is focused on providing American businesses and entrepreneurs with the tools they need to grow and hire. Secretary Pritzker is a key member of President Obama’s economic team, with 27 years of private sector experience. Since taking office, she has worked closely with the business community and helped advance the President’s priorities of expanding growth and opportunity for all Americans. Guided by conversations with more than 1,500 CEOs and business leaders, and over one-third of the Fortune 500 CEOs, Secretary Pritzker has developed the “Open for Business Agenda.” This bold strategic plan and policy blueprint for the Commerce Department focuses on expanding trade and investment, unleashing government data for economic benefit, spurring innovation, protecting the environment—and executing these priorities with operational excellence as careful stewards of taxpayer dollars. As the country’s chief commercial advocate, Secretary Pritzker leads the Administration’s trade and investment promotion efforts. In her first year in office, she traveled to 19 nations and led four trade missions, including the first to the Middle East by a Commerce Secretary in 15 years and a commercial diplomacy mission to Ukraine, Poland, and Turkey at the request of President Obama. In June 2014, she became the first-ever Commerce Secretary to travel to Burma, as part of her central role in the Administration’s strategic rebalance to the Asia-Pacific region. Her multiple trips to the region have strengthened and deepened our commercial relationships on the continent. A prominent advocate for America’s economic growth, Secretary Pritzker has initiated the United States High Level Economic Dialogue with Mexico, expanded our Foreign Commercial Service presence around the world, and worked with the American business community on urgent issues, such as the crisis in the Ukraine. Helping U.S. firms of all sizes discover new markets overseas has long been a Commerce Department priority. Secretary Pritzker accelerated and expanded that tradition in May 2014 by launching NEI/NEXT, an updated and revitalized continuation of the President’s successful National Export Initiative. This export-promotion program will build on the 11.7 million American jobs supported by exports in 2014 by spurring more sales of U.S. goods and services from companies of all sizes in overseas markets. Outbound exports and inbound investment are both necessary for U.S. economic competitiveness. As such, Secretary Pritzker has also directed the growth of SelectUSA, the nation’s first-ever foreign direct investment program which has already helped to attract more than $18 billion to the United States in the 30 months since it was created. In October 2013, Secretary Pritzker and President Obama led the success of the first-ever SelectUSA Summit, an event which brought together participants from 60 countries and 450 foreign or multinational firms to explore the advantages of investing in America. Making the United States a magnet for investment requires maintaining our global edge in talent, innovation, manufacturing, and entrepreneurial risk-taking. Secretary Pritzker has advanced the resurgence of American manufacturing by supporting President Obama’s proposed National Network for Manufacturing Innovation, a public-private partnership model that would foster regional “innovation ecosystems.” This network of regional centers, several of which have already been created, would connect industry, economic development organizations and academic and research institutions to drive breakthrough technological advances that benefit a region’s manufacturing base. Other manufacturing initiatives led by Secretary Pritzker include the Investing in Manufacturing Communities Partnership and the Advanced Manufacturing Partnership. She has also helped bring the Patent and Trademark Office closer to its customers—America’s innovators and entrepreneurs—by overseeing the opening of the first-ever permanent satellite office west of the Mississippi, in Denver, with two more offices in Silicon Valley and Dallas opening next year. America’s entrepreneurial spirit is both a source of domestic competitiveness and one of our greatest exports. President Obama asked Secretary Pritzker to chair the Presidential Ambassadors for Global Entrepreneurship (PAGE) program, an initiative that deploys 11 of America’s most successful entrepreneurs to inspire and cultivate the next generation of entrepreneurs around the world. Secretary Pritzker and members of the PAGE initiative have engaged in entrepreneurship promotion events all over the country and the world, from Ohio to Arizona, and from Saudi Arabia to the Philippines to Ghana. In addition to traditional Commerce priorities like trade and manufacturing, Secretary Pritzker has expanded the Department’s focus to include, for the first time, skills and workforce development. She is leading the Commerce Department’s first-ever effort to ensure American workers have the skills they need to be competitive in the 21st century. Under her leadership, the Department has focused on coordinating employers with job-driven training initiatives through a $600 million investment from the Trade Adjustment Assistance Community College and Career Training (TAACCCT) and apprenticeship programs to communities across the country. Before joining the Administration, Secretary Pritzker founded and served as advisory board chairman of Skills for America's Future, a national initiative that works directly with employers to develop training mechanisms to prepare workers with in-demand skills. In 2012, she also helped launch Skills for Chicagoland's Future, the first city model of Skills for America's Future. Secretary Pritzker is past chair of the Chicago Public Education Fund and a former member of the Chicago Board of Education. In recognition of her commitment to education and skills development, Secretary Pritzker in 2014 received the Harry S. Truman award from the American Association of Community Colleges. Data are the fuel that powers the 21st century economy, and Secretary Pritzker has committed to unleash more of the power and potential of Commerce data than ever before to boost private sector growth. The data collection performed daily by the 12 agencies of the Department literally reaches from the depths of the ocean to the surface of the sun – producing vast amounts of data on trade, technology, economic development, the environment and other areas. Through a number of public-private partnerships, Secretary Pritzker is also working to make more of the terabytes of data collected each day more easily accessible to the public and businesses, specifically through the creation of application programming interfaces (APIs), which will improve the dissemination of data to developers and data entrepreneurs. During Secretary Pritzker’s tenure, the Commerce Department has taken a leading role in federal government efforts to engage the business community and other stakeholders through technology and social media. She is the first U.S. Cabinet Secretary to use Instagram, holds regular online dialogues, and created the Department’s first-ever Office of Digital Engagement, a platform that allows the agency to share more information about its resources to businesses of all sizes, and other customers. Before joining the Obama Administration, Secretary Pritzker founded and ran five different businesses in the real estate, hospitality, senior living, and financial services industries. She served as CEO of PSP Capital Partners and previously developed companies in diverse sectors such as luxury living for older adults, off-site airport parking, and agriculture. She has also served on the boards of a number of major corporations, such as Hyatt Hotels, La Salle Bank, and the William Wrigley Jr. Company, and she was Executive Chairman of Trans Union. While this is Secretary Pritzker’s first government position, public service has been her lifelong passion. In 2012, she received the Woodrow Wilson Award for Public Service, an honor given to individuals who have served with distinction in public life and have shown a special commitment to seeking out informed opinions and thoughtful views. 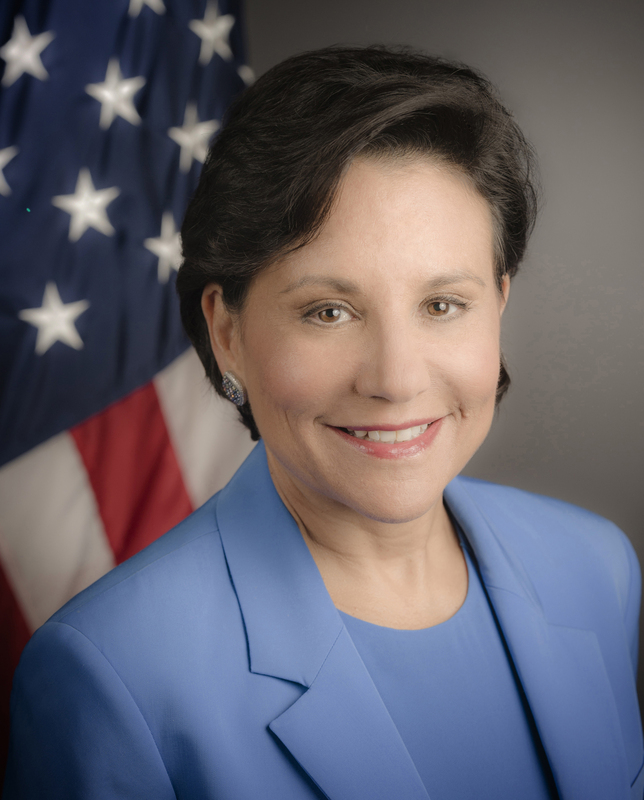 Secretary Pritzker earned her bachelor's degree in economics from Harvard University and J.D. and M.B.A. degrees from Stanford University. She and her husband Dr. Bryan Traubert have two children.